What is it with the Washington Post, and the rest of the media? Everyone is reporting that Alaska's now-infamous "Bridge to Nowhere" - the $223 million boondoogle bridge connecting Ketchikan Alaska to, well, pretty much nothing - has been killed. But it hasn't been killed. The "Bridge to Nowhere," a pork-barrel project that has attracted a lot of unfavorable attention, may not be going anywhere for a while. The $223 million span linking the small town of Ketchikan to sparsely populated Gravina Island and a second Alaskan bridge project have been stripped of their funding by congressional negotiators as they race to wrap up legislative business. But the maneuver is largely cosmetic and may only slow the bridge projects. 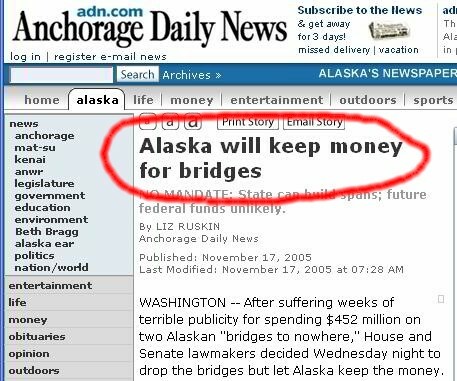 As part of the deal, Alaska will get to keep the $454 million that Congress set aside for the two bridges, and technically the state can use the transportation funds for any project it chooses -- including the bridges. So, all the GOP Congress did was take the name off of the project, they're still giving Alaska the extra money the state wasn't getting, but for this project. Sure, the money is going to the "state" for them to decide how to spend - again, money that wasn't necessary - but the governor is the former Republican Senator, where do YOU think the money is going? Not only is this classic "business as usual" in the Congress - pretending to do the right thing when they've actually just pulled a fast one on the public - but this time the media bought it, hook, line and sinker. Why didn't the Washington Post report: Congress refuses to delete money for Bridge to Nowhere? Nope. They put a headline and first couple of paragraphs that make you think the bridge has been killed and Congress did the right thing. When in fact, Congress went out of its way in order to trick the American public. That should be the headline, congressional deceit. Just like with the Bob Woodward story, and so many stories since the Republicans took over the White House, the mainstream media refuses to go the extra step and report the truth, rather than simply reporting the spin. This story is clearly about how the GOP pulled a fast one to try and hide the bridge funding. Yet the Post and the rest of the media report it as a victory for fiscal responsibility. Pitiful.